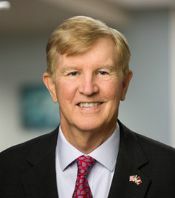 William R. Nicholson has over 35 years of commercial, mortgage and investment banking experience. Prior to joining Heritage Capital Group, Mr. Nicholson worked with BSE Management, a private equity firm focused on acquiring failed banks. In this role, he managed the due diligence and bank target processes. At Heritage, Mr. Nicholson concentrates on M&A advisory assignments, commercial real estate, capital raising, debt placement and litigation support. He has worked with clients on derivative disputes, loan pricing issues, matters related to foreclosures, lender liability, director and officer governance and environmental. Mr. Nicholson offers the following services: strategic consulting, litigation support, and executive search. Criminal Bank Fraud; Directors & Officers Liability; Construction Loans. Mr. Nicholson is qualified as an expert witness in Federal and State court. He serves both plaintiff and defense lawyers. One of two in the graduating class of 110 recommended for the Ph.D. track.